"Considerable lumbering operations are being conducted in the mountain forests near the station. Addie is merely the trading point and a communicating center for the employees of the lumber operations. This is the nearest railway station to the crest of Amos Plott, one of the famous peaks of the Balsam region." 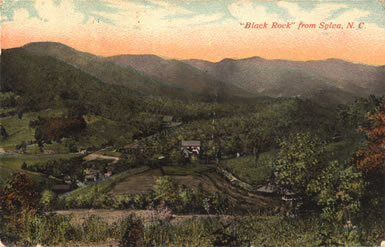 Black Rock from Sylva, N.C. Although this postcard view, dated 1914, notes that it was taken near Sylva, the guidebook Western North Carolina at a Glance (1912) noted that Addie was “the nearest railway station to the crest of Amos Plott, one of the famous peaks of the Balsam region.” Black Rock, a prominent feature of the Plott Balsam range, rises to an elevation of 5,810 feet above Addie’s elevation of 2,249 feet. According to James Mooney in Myths of the Cherokee, the Cherokees referred to either Black Rock or an adjacent mountain peak as Un’wada-tsu’gilasun’, “where the storehouse was taken off,” in reference to a rock formation that resembled a storehouse and which was destroyed by lighting about 1850. "Scott’s Creek, a lovely mountain stream in which placid pools and rushing cascades alternate bewilderingly and which is filled with trout, is crossed by the Railway a trifle more than a mile from Addie. The creek was named for John Scott, a noted character of this region, who, for many years, was a trader among the Cherokee Indians. Here the Railway makes a short, graceful curve almost directly to the South, but again resumes its Northeasterly course at Willits, N.C."
Mooney, James. Myths of the Cherokee. Washington: Government Printing Office, 1902. Powell, William S. The North Carolina Gazetteer. Chapel Hill: University of North Carolina Press, 1968.